Crafts : She mixes paint and soap and when she takes a straw we understand her great idea! She mixes paint and soap and when she takes a straw we understand her great idea! This method is really easy to do! This tip is cheap because you probably have the ingredients at home: acrylic paint, dish soap and a straw. It is also a perfect activity for children on holidays: It's really easy to do and the result is amazing! In addition to acrylic paint, dish soap and a straw, you will also need a canvas or a thick paper or cardboard to decorate. Pour paint with water to dilute it in a bowl, then add few drops of dish soap. 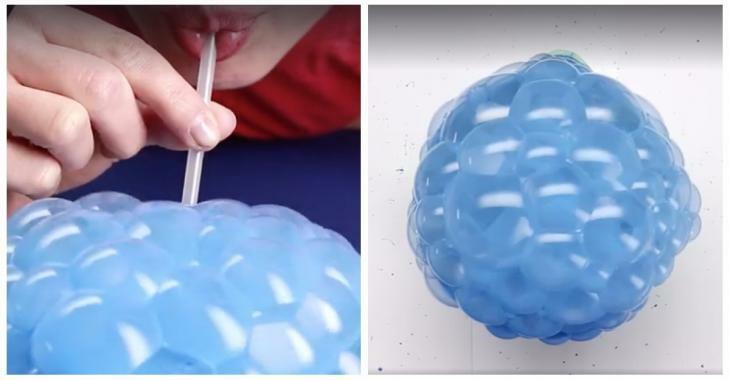 With a straw, blow into the mixture to make bubbles. You will get very compact colored bubbles. When the bubbles come down, you just have to blow back into the mixture. Press your paper or cardboard on the bubbles: be careful not to soak the paper. For a surprising result every time, prepare bowls with different colors and have fun: you will get a framework, nice stationery, original envelopes, etc.